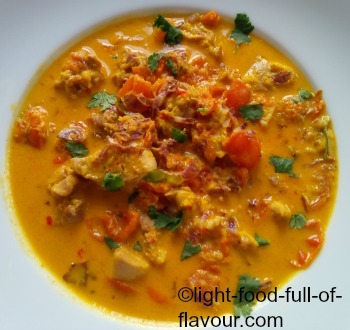 A different curry, a delicious Japanese-style chicken curry with miso which is full of flavour but milder than some other curries. I am using whole spices which I dry-roast and grind in a pestle and mortar. This is not difficult to do – and the taste of your food is vastly improved when you are grinding your own spices instead of using shop-bought ready-made curry powder. I sometimes use an old coffee grinder to grind my spices but as the cumin seeds are too small for the one I have, I use a pestle and mortar for this curry spice mix. The miso I am using in this recipe is a sweet white fermented rice and soybean puree/paste. Eating fermented food is a good way to promote a healthy intestinal flora and to boost your immune system. Miso is also very tasty and will help to thicken up the sauce. It is great to use in soups. Just remember that miso is quite salty (the darker the miso the saltier it is). I bought mine in a health food shop but you can find it among Asian food in well-stocked supermarkets, or in an Asian supermarket. 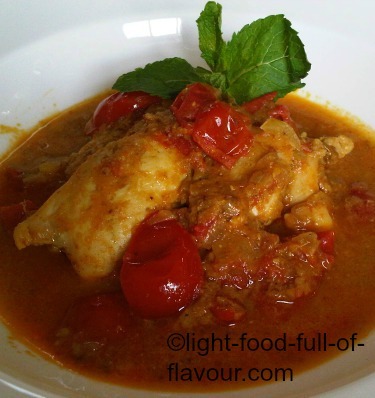 Not only is this chicken curry with miso utterly delicious, it is also very low in calories. The only fat I am using is the healthy coconut oil that I cook the ingredients in. Coconut oil/butter is the healthiest fat to cook your food in. The fat in coconut oil is what’s called short-chain saturated fat, unlike butter which is a long-chain saturated fat. I always use it now when I’m cooking Asian-style food and here in the U.K. it is sold in most supermarkets, as well as in health food shops. If you want to keep this a low-calorie-meal, don't eat it with refined white rice as this will make your blood sugar level shoot up. Quinoa or brown rice is the best alternative. 1. Start by dry-roasting the coriander, cumin, mustard, fenugreek seeds and chilli flakes in a frying pan over a medium-high heat for 1-2 minutes – until they become fragrant. Place the spices in a pestle and mortar and grind to a fine powder. Mix in the ground turmeric. 2. Place the coconut oil/butter in a large non-stick frying pan over a low heat. Add the onion, garlic and ginger and stir and cook for 5 minutes. Add the spice mix and continue to stir and cook for a further 30 seconds before adding the tomatoes to the pan. Continue to cook for a further 10 minutes, stirring every now and then. 3. Add the chicken pieces, increase the heat and keep turning the chicken pieces over until they start to colour. Add the miso paste and water and season with some salt and freshly ground black pepper. Stir and bring to a simmer. 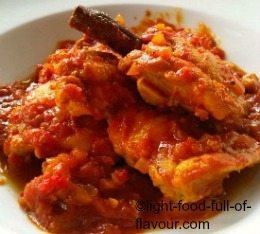 Allow the curry to simmer over a medium-high heat for about 20 minutes. Taste and check the seasoning to see if you need any more salt and/or pepper. 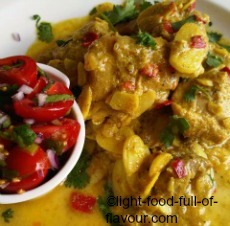 This chicken curry with miso is great dish to make beforehand as the flavours will intensify when left to stand. Serve the curry with rice (preferably brown rice) or quinoa and steamed green vegetable – such as tenderstem broccoli (broccolini) sugar-snaps, green beans.